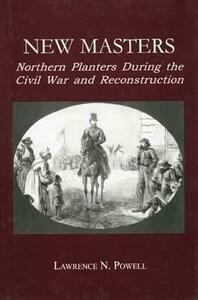 New Masters: Northern Planters During the Civil War and Reconstruction. New Masters: Northern Planters during the Civil War and Reconstruction, analyzes the North's efforts to transform the South, both during and after the war, into a free labor economy and society. In this ground-breaking work, Lawrence N. Powell addresses the role that the twenty to fifty thousand "new masters," or northern planters, had on the post-reconstruction system. Covering evidence of over five hundred northern planters, Powell asserts that northern emigrants provided much of the capital that hard-pressed southern planters used to stave off bankruptcy; showing that these planters became both the catalyst that perpetuated the plantation system of servitude and debt, as well as became the reason behind the revitalization of the South. New Masters deals with a variety of issues, including race relations, Northern planters' motivations, work habits, capital investment patterns, and the planters' gradual disillusionment as problems mounted and profits declined.